I revisited this tri-point with my sons in 2016. Very different report and better pictures! 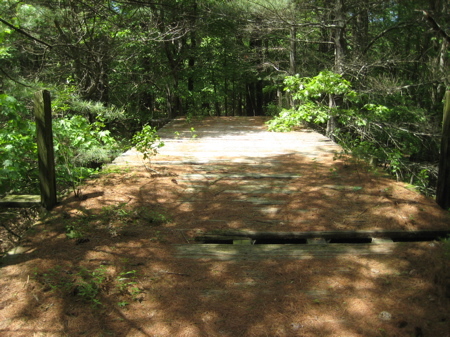 And if you hike to the CT-MA-RI tri-point, you’ll walk along the rail bed of one of the more infamous events in the history of the US. Not that I have to tell you, but the main trail to the tri-point is the rail bed on which the Great East Thompson Train Wreck occurred in 1891! The only time in US railroading history that FOUR trains crashed into each other! And by seeking out the tri-point, you’ll stand at the area by default. (CTMQ report here). Someone really should put up a plaque about the train wreck. There are other routes to this tri-point from other starting points, but I’ll present the easiest and most straight-forward. Believe it or not, there are books and websites out there for people who seek out all the tri-points around the country. The problem with these books (and probably this page on CTMQ in a few years) is that these things change. Not the points themselves, but the trails/routes to get there. Exciting, right? I know I was darn excited. And if you think I’m kidding, you don’t know CTMQ. 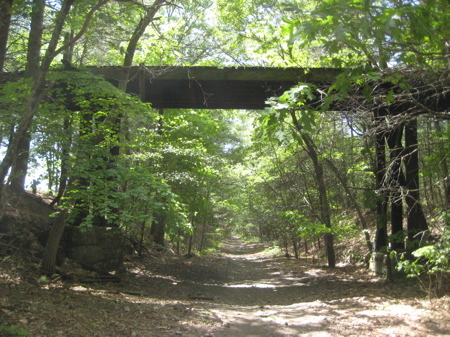 After about a quarter mile, you’ll pass underneath an old railroad trestle bridge. Scurry up to check out the view from the top. How could you not? Bumble back down to your perfectly flat and straight trail. 2015 Update: According to my friend Linda Orlomski, the trail has been flattened and no longer will give you motion sickness. You’ll pass a couple crossing trails along the way. As of this writing the second crossing trail after the bridge will get you to the tri-point if you follow the correct forks. But skip it. Trust me. Just keep walking along the old rail bed. Maybe two-thirds of a mile from the beginning, you’ll see a familiar CT-MA border monument on the right hand side of the old rail bed trail! Now we’re in business! 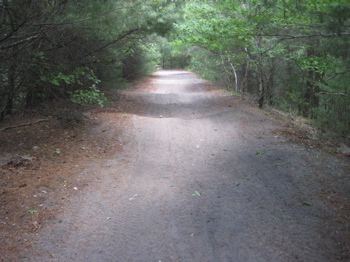 At marker 2, right on the rail bed, you’ll notice a blue-blazed trail heading due south. Follow that. 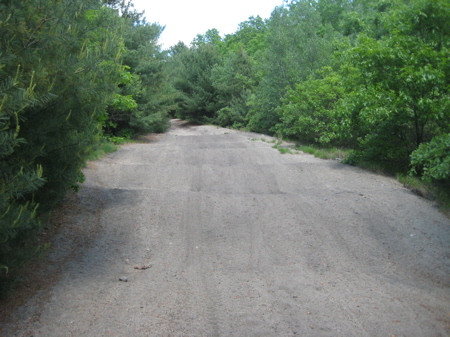 The blue blazes – most of them anyway – mark Massachusetts state forest land. But the trail is a real trail that follows the border south. 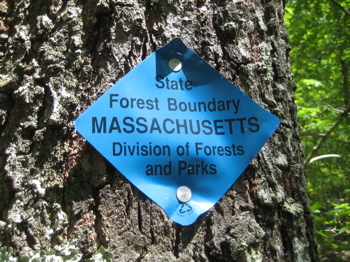 There are also MA Forest boundary signs tacked into a few trees along the way. As I walked the trail, I began wondering how far it goes. That is, can I follow this unofficial trail all the way around the state? Knowing, of course, that the border crosses through much private property and doesn’t stick to nice trails through woods… but I still think it’s doable. The DOT is tasked with checking on the health of every single boundary marker – all 384 of them – every 10 years or so. Where can I sign up for that job? That’s like 374 little mini treasure hunts! Oh man, that would be awesome. For now, I was only interested in finding one more marker after # 2. That would be #1 or O depending on your direction. The trail was easy to follow and again, maybe only another quarter mile. Another huge advantage to this border trail route is that the final push up the hill to the tri-point is about a tenth of the effort as it is coming up from Connecticut. Bound is located on the southwestern slope of a wooded hill, 45 feet north along the crest from the south end of a sharp break, and about halfway up the steep hillside. 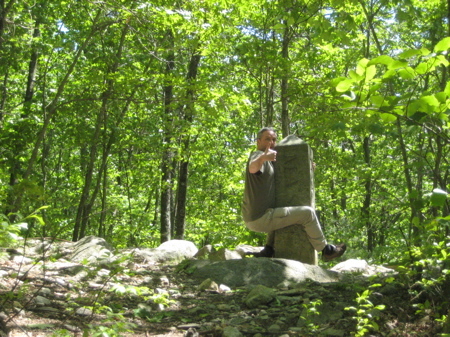 A granite monument, showing 3.9 feet above the ground, marks the bound. 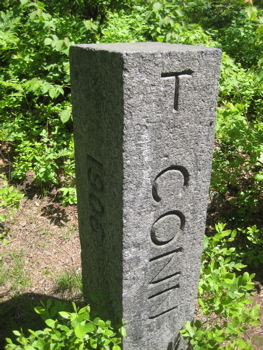 It is 14 inches square with a pyramidal top and is lettered “MASS 1883” on the north face, “RI 1883” on the south face and “CONN” on the west face. The lettered sides are dressed. The east side rock is faced. It is 9 feet long to the base from the 6 inch pyramidal top. Monument was set in October, or November, of 1883 by a Massachusetts-Rhode Island commission. 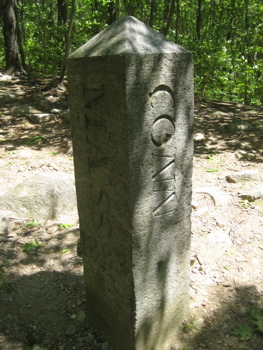 The 1941 commissioners accepted the monument as correctly marking the northerly end of the line established in 1840. DOT Perambulation, the greatest thing ever. I’m pretty excited about this too — wish I could visit there someday. Thanks for all you’ve written about the extreme points of CT. I live in New Britain and got interested highpointing and the directional extreme points of in the summer of 2010. (I’ve been to 11 state highpoints so far and I’ve also been to the easternmost point of the US in Lubec, Maine.) I’ve also been to the westernmost point of CT and the “southernmost point” of CT on Great Captain’s Island. I didn’t see any marker but I went out as far as I could see land above water. I tried to get to the southernmost point on the CT mainland but was unable to because it seems to be a private beach. I hope to visit the two Tri-State points and the highest point soon. 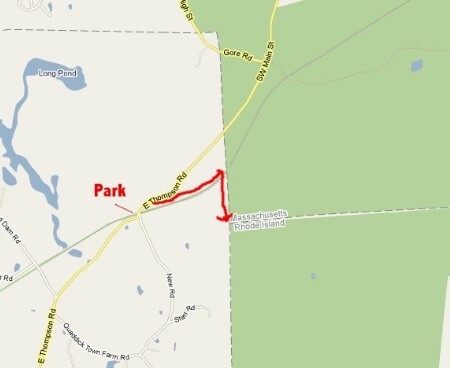 But I haven’t seen anything written about the northernmost point (it looks to be near Joyceville, CT – not to far from Mt. 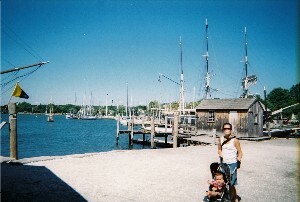 Frissell) or the easternmost point (it looks to be somewhere near Sterling or Voluntown). Do you have any idea if there are markers at those points and/or how to get there? Yes, after much frustration, I am happy to report that I now know how to get to the N-most and E-most points. Just check out that link to the DOT Perambulation docutments and you’ll figure it out. The easiest way to both requires entering some commercial private property, but I think we can sort that out. I’ve been very close to both in the past but have never “made the move” to actually nab them. As for the S-most, I don’t even consider the Greenwich private beach anything. As you did, you must get out to Great Captain Island to achieve the ultimate CT-southerness. Hey Lin I know who you are and Tonka and Sugar sure did cover a bunch of this ground didn’t they ?We were all over here with your ponies and later our trail bikes!East Thompson will always be “Home” I never left Thompson just moved a few miles into North Grosvenordale. Thanks for the directions! It was extremely easy to find – up and back in about an hour. We would’ve never found it otherwise. Thanks for the blog. CTMQ has to be one of my favorite sites. Took my wife and 2 month old son today, for his first tri-point. Had a good time. More tri-points to come in his future. My girlfriend and I found this one, one week after I went to the New York,Mass, Ct one. This one was much easier to get too. The abandoned train trail is up and down as written here. When you take the right at the Mass Marker that hike is a little more challenging as you climb up and over rocks. We also encountered a few small snakes. When said and done the the hike from your car to the tri-point should take no more then 30 minutes. The ones on the shoreline bottom west and bottom east look like they are a challenge too as you have to cross private property. I found them at ct.portal.com. This is fun!!!! What a gem! We visited this past weekend. Read about the tri-point in a local article, then stumbled upon your site after doing a search. Thanks for the detail! I am finding your site thoroughly enjoyable. As hiking/museums/curiosities are right up our alley, I am sure to be a repeat visitor. Your posts about your family have been an added bonus, especially as the parent of a special needs child. I was struck by your citing of another parent’s blog describing their diagnosis as being the defining moment of losing their adult son. I suppose a certain degree of loss is experienced by all. However, I like to think of the positives. 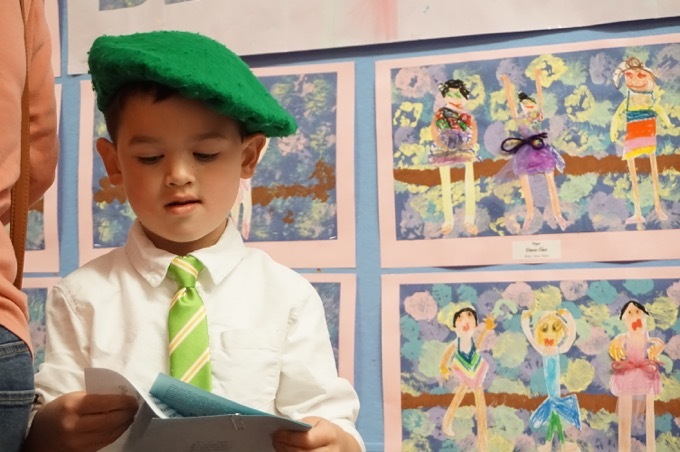 My son also has been known as the mayor in our parts, and I have faith that the impressions he has left will serve him well throughout his life. (As a side note, “our parts” is northeastern CT. As I continue to read your posts, I hope I will find that over the years you have been able to find a greater appreciation for all that the Quiet Corner has to offer! Although I will concede that, even today, Rte 44 in NE CT is not a road you want to be traveling on in a snow storm!) Back to my point… I think of the stresses and pains that my son won’t have to deal with. It brings a smile to my face to think that his primary “job” in life will be to spread the joy and smile that he so well possesses, and I know he will be highly successful however he chooses to do this! I hope this finds you and your family are well. Thanks for the info. We’ll be hiking there soon. We live across the line in Pascoag, RI, and I’ve always wanted to find the tri-point. We love “The Quiet Corner” but let’s not tell too many folks. 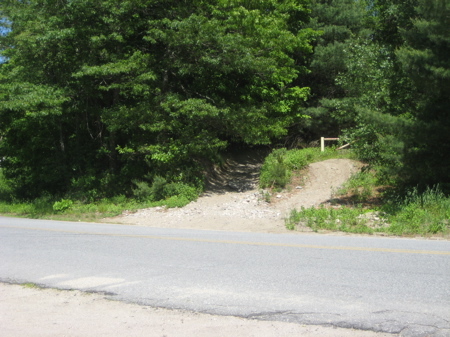 A note on those “those humps on the rail road bed…to discourage off road vehicles”: Dirt bikers love those humps. They’re more fun than flat road. Somebody should have been able to figure this out. When I was a kid we’d gravitate toward such “obstacles.” I’m more mature – and careful – now, but just sayin. Can anybody tell the total distance from the spot you park your car and begin your hike? I am hoping to do this towards the end of the week. Thank you! !